Thanks to everyone who entered our last challenge and congratulations to the winners. The theme for this challenge was chosen by our talented friend and leader, America. She chose Black and White with just tones of grey, no color! This was hard for me as I do like to color. Had to sit on my hands several times so I didn't reach for a bright red marker! Going forward, the Top 2 picks will win a spot as the Guest Design Team Memebers for our next challenge. This challenge will run through Sunday, January 29th. Hope you can dust off your House Mouse, Gruffie and Happy Hopper stamps and join us for this challenge. Our next challenge on January 30th will be a blog hop, with lots of great prizes from our sponsors and the girls on the team. Make sure you check back on the 30th for all the details. Sue, this is brilliant! Love the sentiment you've chosen to go with these two hockey players. It is a stunning card for the black and white challenge! What a wonderful card Sue. 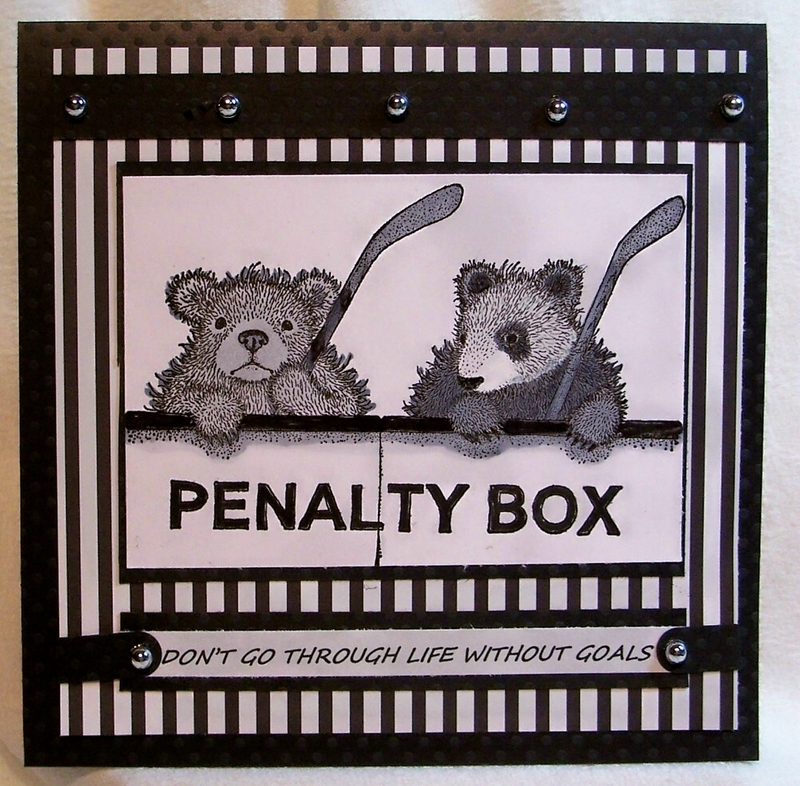 I'm so pleased to be working with you on the House Mouse team, this is a gorgeous B/W creation. Fabulous sentiment and image. 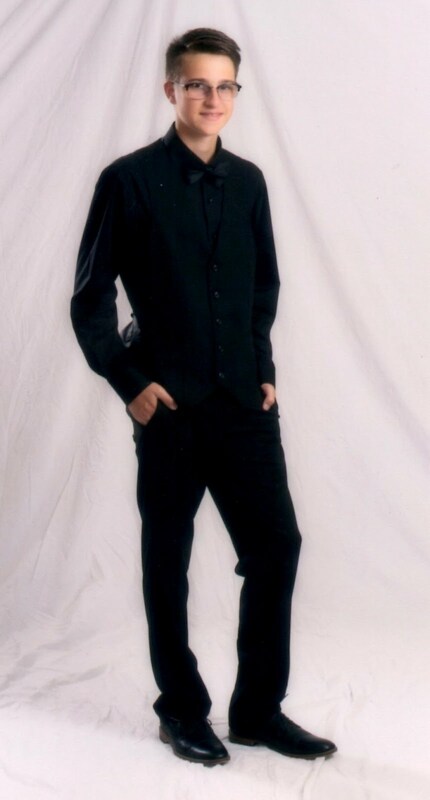 Sue, this is so cute! 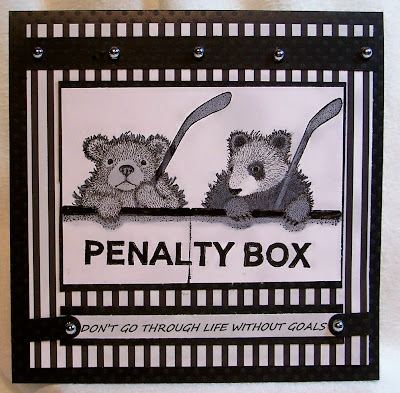 I totally love it - I needed this card when my girls were growing up - I had to put them in the penalty box all the time! LOL! Beautiful black and white card! That image cracks me up! o that looks cute sue, just beautiful. What wonderful images you have created with, Sue! 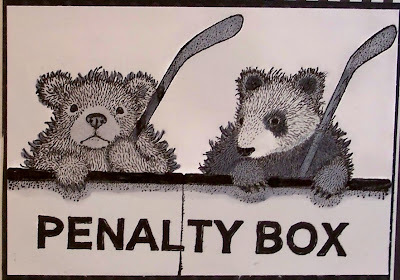 I feel like I am in the Penalty Box most of the time! Well I am so late arrived it nearly made it for last challenge - shame on me !!! This is absolutely adorable - I love those Gruffies and your design and colours of perfect for the Black and White challenge. Fab card - so chuffed to be joining you all at the HM & F MC!! !